The QUICK EZ VFR/IFR DIVERSION HEADING FINDER helps VFR pilots to quickly finder the magnetic heading for a diversion airport or waypoint. 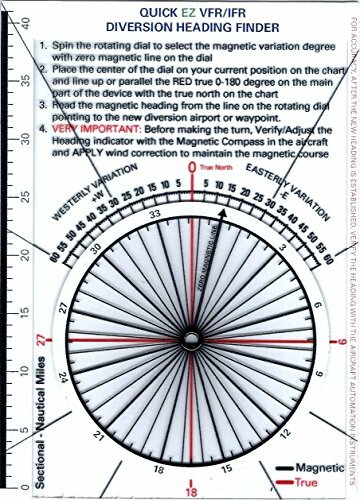 The pilot will pre-set the magnetic variation, place the heading finder on the current aircraft position on the chart, line up the edge to the true north then read the diversion magnetic heading from the magnetic line on the rotating part pointing to the new airport or waypoint. The ruler on the left edge helps measure the distance between the current position to the new diversion airport or waypoint. Find your diversion magnetic heading quick and easy and have more control on flying the aircraft while being diverted. View More In Aviation GPS. If you have any questions about this product by EZDIVERSION SOLUTION, contact us by completing and submitting the form below. If you are looking for a specif part number, please include it with your message.